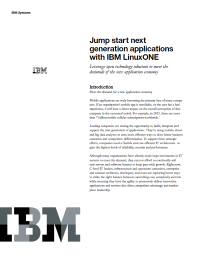 Download this solution brief to learn how IBM LinuxONE solutions can unleash the full potential of Linux in your organization. In today’s economy, mobile applications are the primary face with customers, and innovative organizations use Linux and open source technology solutions to deliver the applications serving millions. But it’s imperative that these applications be fully supported by enterprise-grade capabilities such as nondisruptive scalability, unparalleled availability and continuous data protection. IBM LinuxONE provides users with a flexible yet powerful infrastructure that helps ensure that a business receives the performance, reliability, security and processing power it needs to address increasingly sophisticated and demanding application requirements.